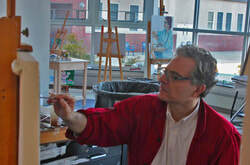 I am a representational painter, and each image is constructed from observation from the onset to finish. My education in painting began by attending my local Community College. It was a wonderfully supportive place with faculty who cared. They were also engaged in their work and exhibited often within the art community of Rochester New York. Initially I believed that commercial art would be the direction for me to follow. It was a reasonable path and it offered a means to make a living. However, upon my first visit to the Metropolitan Museum, my life direction changed dramatically. It was there that I had my first encounter with paint creating the illusion of the material world. The expressive power of Cezanne especially cemented the fact that I had to become a painter. And once this moment happened, the die was cast. I could not think about any other path but painting. One college lead to the next and I finally completed my degree work at SUNY New Paltz and then at Brooklyn College. In those days, representational work had made a serious comeback thanks to the impact of many seminal artists on the East and West Coast. I would say that Fairfield Porter opened the door again for many who were inclined to paint from nature. And I would say that the Bay Area painters had an enormous impact as well. At Brooklyn College the artists Lois Dodd, Philip Pearlstein and Lennart Anderson changed the lives of many who studied there. I am one of many in that generation. Since that time I have formed relationships with magnificent realist artists who have become prominent influences in my life.